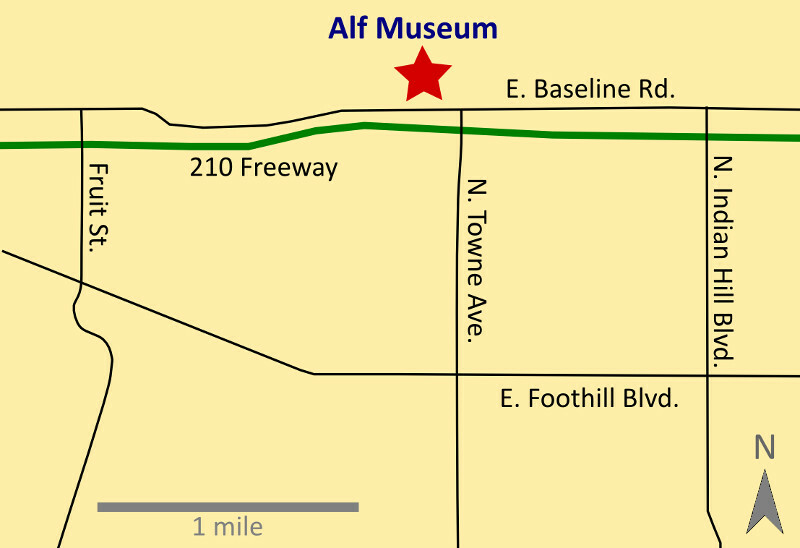 From the 210 freeway, take the Towne Avenue exit and head north on Towne Avenue. When you reach the light for West Baseline Road (only a few hundred yards from the freeway exit), turn left (west). The campus/museum entrance will be on the right side (north side), a few hundred yards past the Towne/Baseline intersection. For a Google map, click here. Some mapping programs may tell you to enter campus via Webb Canyon Road; this is incorrect, and you should use the main entrance to campus on Baseline Road. Although the Alf Museum is open to the public, the rest of The Webb Schools campus is closed to visitors. Those wishing to tour the campus itself should make arrangements through the Webb admissions office. For the safety of our students, all museum visitors must check-in at The Webb Schools security welcome kiosk in the main parking lot and have a valid picture ID. Thank your for your understanding! No food or drink is permitted in the museum exhibits. No picnicking or dining facilities are available; Memorial Park at 10th and Indian Hill Blvd. in Claremont is available for picnics. Parents / guardians must remain with children at all times. If you have any special needs or concerns, please contact the museum at 909-624-2798. If you are visiting with a large group (12 or more people), we recommend contacting the museum in advance so that we can ensure adequate parking space. Professional photography and video equipment beyond a DSLR or handheld camera are not allowed without prior written permission from museum staff. Drones are strictly prohibited on The Webb Schools campus.